Ask The Festival Lawyer: Will I Get in Trouble if I Bring Someone Overdosing to the Medical Tent? In one of your prior articles you mentioned that California has a law saying you can’t get in trouble for getting a friend help if they are having a drug overdose. Is that true? What if I am high or carrying drugs myself? Won’t police just arrest me at the medical tent? The problem of accidental overdoses is way bigger than you might think. In fact, accidental overdoses are the second leading cause of injury death in the United States; more people die from accidental overdoses than motor vehicle accidents. And it’s not users of illegal drugs who are causing this huge spike in numbers. Nationally, more overdose deaths are caused by prescription drugs than all illegal drugs combined. Like a heart attack, the minutes after some types of drug overdoses are critical. For example, someone overdosing on the drug gamma-Hydroxybutyric acid, also known as GHB, needs immediate help managing their airway and breathing. A person experiencing an opiate overdose can get immediate help counteracting the effects of that drug from an injection of Naloxone. Listen, I’m not suggesting that you or your friends are partying with heroin and GHB. What I am saying is that being a good festival buddy means taking care of your friends – and recognizing when a friend is having an overdose and getting them immediate medical attention can literally be a matter of life or death. But here is the problem. If someone has a heart attack, people don’t stand around and say, “Uh, I smoked cigarettes and ate cheeseburgers with him earlier today. I even still have a few cigarettes on me. If I call the police, am I getting in trouble?” But when it comes to overdoses, people often waste valuable time worrying about the consequences from law enforcement if they get help. The person is acting in good faith and is seeking medical assistance for another person experiencing a drug-related overdose. The person does not obstruct medical or law enforcement personnel in their duties. It should be noted that this law does not apply to or change any law relating to selling, giving or exchanging of drugs. In 2007, New Mexico was the first state in the nation to pass a 911 Good Samaritan overdose fatality prevention law. Since then, 27 additional states – Alaska, Arkansas, California, Colorado, Connecticut, Delaware, Florida, Georgia, Illinois, Kentucky, Louisiana, Maryland, Massachusetts, Minnesota, Mississippi, Nevada, New Jersey, New York, North Carolina, North Dakota, Oregon, Pennsylvania, Rhode Island, Vermont, Washington State, West Virginia and Wisconsin – as well as the District of Columbia, have passed such laws. These 911 Good Samaritan laws vary a great deal from state to state in terms of what they provide. A good summary of different states’ laws can be found here. I asked Joseph Pred about 911 Good Samaritan laws and the confidentiality of medical tents at festivals. Joseph has spent the past 15 years as an emergency and risk consultant with his company Mutual Aid Response Services and was the Chief of Emergency Services at Burning Man for 18 years. In short, even in places where there is no formal 911 Good Samaritan law, medical staff at festivals are way more interested in getting accurate medical information than trying to bust people. For example, Bonnaroo does a great job on its website of making it clear that their tent is a “no questions asked” safe haven. If you or a friend are in trouble, please seek out medical help IMMEDIATELY. Medical and security are safe havens at Bonnaroo, and you will not get in trouble for anything you do or say. 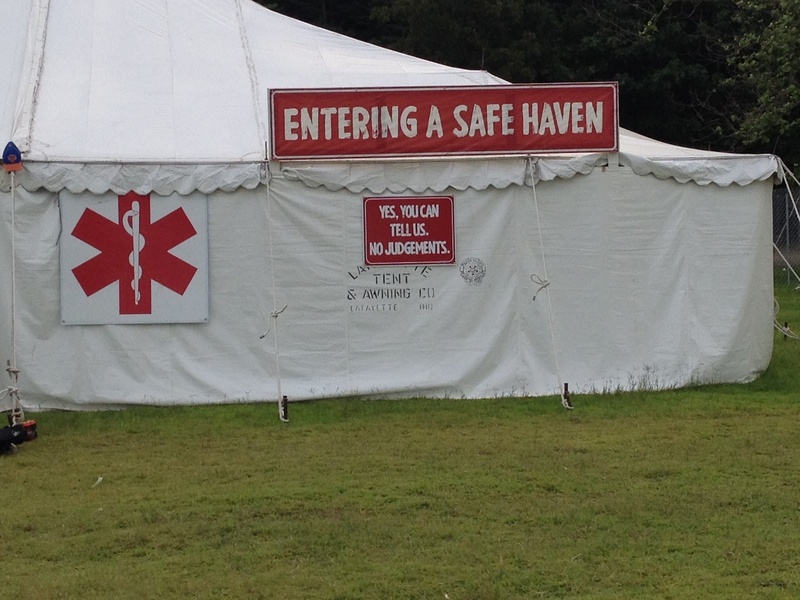 Their only concern is your well­-being – and look at what a great job their medical tent does sending that same message to festival goers. If festivals are doing their part, we festies need to as well. Be a good festival buddy and look out for your friends. If you’re not sure whether your friend’s condition is an emergency, assume it is and get help right away. if you’re not near a medical tent, find a staff person with a radio, or notify the nearest security personnel so that they can get you whatever help you may need.